Are you one of those people who loves to beef up on the history of the places you’re going to visit on your trip? Whether it’s the History section in a Lonely Planet guidebook or a deeper delve into the literature of the country, any insight you gain into your destination will pay off. You’ll have a much better understanding of the people and the culture if you’ve done a little reading. 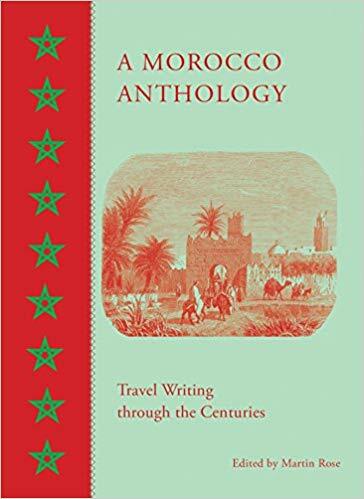 The arrival of this little book a couple of weeks ago, A Morocco Anthology: Travel Writing through the Centuries, edited by Martin Rose, prompted me to draw up a list of books in English about Morocco so that visitors can explore as much as possible. 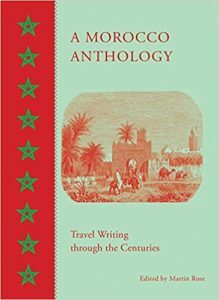 The anthology features some of the major cities in the country, and includes writings dating from 1613 (The Waters of Fes by Samuel Purchas) to 1942 (Through a Sailor’s Telescope and The Navy in Descriptive Mode, both from the British Naval Intelligence Handbook). Walter Harris, Samuel Pepys, Edith Wharton, Pierre Loti and some les well-known writers are all there. There’s a wealth of books about the Morocco that was. Fatima Mernissi’s Dreams of Trespass: Tales of a Harem Girlhood stands out as a vignette of life in the Fez medina in the 1950s. And who can resist the true story of a young English woman, Emily Keene, coming to Tangier as a governess in 1872 and marrying the Cherif of Ouazzane? Her tale is told by Khalid Berkaoui in The British Bride of Tangier, with its splendidly Orientalist cover. Gavin Maxwell’s Lords of the Atlas is a thumpingly good yarn about the brutal Glaoui family who rose to power in the High Atlas, only to fall miserably out of favour after the Protectorate years. But it’s not all about history. Searching out current fiction in English by Moroccan writers threw up a wide choice: among others, there’s Laila Lalami (The Secret Son, The Moor’s Account), Tahar Ben Jelloun (The Sand Child) and Mahi Binebine (Horses of God). Foreigners writing about Morocco include Tahir Shah (The Caliph’s House, In Arabian Nights) and Saeida Rouass (Assembly of the Dead). This just scratches the surface of what’s available. If you’re in Fez, check out the excellent English language bookshop at ALIF, 2 Avenue Ahmed Hiba in the Ville Nouvelle. Meanwhile, contact us for our full reading list.